The administration recently estimated that the toll bridge seismic retrofit program will require an additional $3.2 billion to complete and has recommended changing the Bay Bridge's design to save money. The Legislature faces two key decisions: (1) whether to approve a redesign of the Bay Bridge east span and (2) how to fund the program's completion. Redesigning the Bay Bridge could save money, but also raises the risk of cost and schedule increases that could more than offset the savings. Funding should come from both state and local sources, and the Legislature has several options regarding the sources used and the amount to provide from each. In August 2004, the administration estimated that the total cost to seismically retrofit seven state-owned toll bridges would be $8.3 billion, including $900 million in funding for contingencies. This amount is $3.2 billion more than the total funding provided for the program to date. Most of the cost increase is associated with the rebuilding of the east span of the San Francisco-Oakland Bay Bridge (Bay Bridge). In order to reduce total costs, the administration reexamined various design options and recommended to the Legislature in December 2004 that the bridge design be changed from the current self-anchored suspension (SAS) bridge to a viaduct (or "skyway") with no tower. This report first provides a brief history of the Department of Transportation's (Caltrans') toll bridge seismic retrofit program. It then (1) explains the current status of the program and the administration's proposal to complete it, (2) discusses several factors the Legislature should consider when deciding whether to redesign the Bay Bridge, and (3) identifies the key options available to the Legislature for funding the program. Cost overruns and delays in the toll bridge seismic retrofit program are not a new phenomenon. Estimated total costs for the program increased more than seven-fold between 1996, when dedicated funding was first set aside for the program, and 2001. Estimated completion dates for the most complicated work are also now significantly later than originally projected. As the total cost of the program has grown, state law has been changed repeatedly to authorize more funding for the program. Figure 1 lists the main features of the toll bridge seismic retrofit funding legislation over time. These statutes are further detailed in the brief history that follows. Authorized $2 billion in general obligation bonds to fund bridge seismic retrofit, including $650 million for toll bridges. Stated that all toll bridge seismic retrofit costs were to be funded with bonds, with no contribution from state funds or tolls. Provided total authorization of $2.6 billion for toll bridge seismic retrofit from three sources (Proposition 192, state transportation funds, and increase in tolls). Implemented a “seismic surcharge,” increasing Bay Area bridge tolls from $1 to $2 for up to ten years. Created the Bay Area Toll Authority to administer toll funds. Provided total authorization of $5.1 billion (primarily from extension of $1 toll increase) for toll bridge seismic retrofit, including $448 million in overrun authority. Extended seismic surcharge to January 1, 2038.
a Toll collection has been discontinued on these two bridges. While work on the Phase I bridges and study of the retrofit options for the toll bridges were underway, the Northridge earthquake struck Southern California in January 1994. This prompted Caltrans to expand its retrofit program to an additional 1,155 bridges throughout the state, which became known as the "Phase II" bridges. However, there was no dedicated funding source identified for bridge seismic retrofit programs. Rather, work on the Phase I, Phase II, and toll bridges was funded primarily with federal transportation funds that Caltrans could otherwise have used for non-seismic retrofit projects. Proposition 192 Provided $2 Billion in Bond Funds for Seismic Retrofit. In order to relieve the pressure on transportation funding, the Legislature and administration placed on the March 1996 ballot Proposition 192, which the voters passed. Proposition 192 authorized the issuance of $2 billion in general obligation bonds for the seismic retrofit program, including $650 million for toll bridge seismic retrofit and $1.35 billion for the Phase II bridges. Phase I bridges were still to be funded from existing funding sources, but the Proposition 192 bonds were expected to cover the full costs of both Phase II and the toll bridges. However, later that same year, Caltrans reported that the estimated cost of retrofitting the Bay Bridge alone had jumped above $1 billion, thus exceeding the total toll bridge funding level provided by Proposition 192. In February 1997, following recommendations from Caltrans and two review committees, the administration decided to replace, rather than retrofit, the east span of the Bay Bridge (from Oakland to Yerba Buena Island). This decision was based on estimates that a retrofit of the existing span would cost about $1 billion and that a new span, while it could be somewhat more expensive than a retrofit, would be safer as well as cheaper and easier to maintain. Bay Area Chose SAS Design for Replacement Bridge. The administration recommended that the replacement bridge be a viaduct with no tower, commonly known as a skyway design. However, the Metropolitan Transportation Commission (MTC)the Bay Area's transportation planning agencywas given the option to choose a more expensive, "signature" design, as long as the Bay Area paid for the additional cost. After evaluating a cable-stayed design and a SAS design, the MTC decided on the SAS design in June 1998. The features of the three primary types of design under consideration are detailed in Figure 3. It should be noted that even the SAS as currently designed has a viaductor skywayportion. A "seismic surcharge" of $1 extra toll collected on all seven state-owned Bay Area toll bridges for up to ten years would provide up to $907 million, or about one-third of the total cost of the program. Another third of the total funding would come from state sources, mainly the State Highway Account (SHA). The remainder would be funded by Proposition 192. Caltrans estimated at the time that all work to retrofit the toll bridges would be complete by 2004. Caltrans Revises Toll Bridge Retrofit Cost to $4.6 Billion. Unfortunately, the schedules estimated in 1997 proved to be optimistic, particularly for the Bay Bridge east span replacement. Other toll bridges also experienced delays as construction work progressed, and all toll bridges were pushed back at least a year from their 1997 estimated schedules. Project delays in turn pushed costs upward. Caltrans, however, did not reestimate the program's costs until April 2001, when it revised toll bridge retrofit costs upward to $4.6 billion77 percent higher than the 1997 estimate. Total Funding of $5.1 Billion Provided in 2001. In order to fund these new, higher estimated costs, Chapter 907, Statutes of 2001 (AB 1171, Dutra), was enacted. This statute authorized $5.1 billion in total expenditure authority, including up to $4.6 billion to cover the cost of toll bridge seismic retrofit as estimated by Caltrans, plus an additional $448 million in "overrun" authority if costs should rise even higher. The majority of the increased funding would come from extending the seismic surcharge ($1 extra toll) to January 1, 2038 and allowing the state to bond against this revenue stream to finance the cost of retrofit projects. This would bring tolls' contribution to the seismic retrofit program to $2.3 billion, or about 50 percent of the total costs, not including the overrun authority. At that time, the final work on the Bay Bridge was expected to be complete by 2008. Bids and Costs Repeatedly Higher Than Estimated. The funding level provided by AB 1171 assumed a cost of $2.6 billion for the Bay Bridge east span replacement. However, in December 2001, the low bid for the skyway portion of the east span came in about $300 million higher than Caltrans had estimated, and in May 2004, the lone bid for the SAS portion of the east span replacement exceeded Caltrans' estimate by $700 million. Costs for the Richmond-San Rafael Bridge also turned out to be significantly higher than assumed in AB 1171. Latest Cost Estimate Ballooned to $8.3 Billion; Completion Due in 2011. With these and other cost increases, Caltrans reported in August 2004 that it would cost $7.4 billion to complete the toll bridge seismic retrofit program. Caltrans also identified an additional $900 million to cover potential future cost overruns. This brought the total cost estimate for the program to $8.3 billion$3.2 billion more than the level authorized in 2001 by AB 1171. The estimated completion date for the program was again pushed back, to 2011. 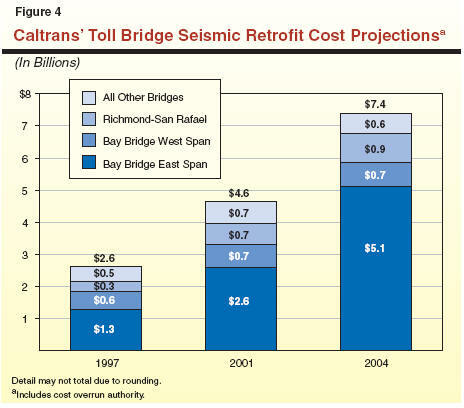 Figure 4 compares the latest projected total costs of the toll bridge seismic retrofit program to earlier projections, divided by bridge. As the figure indicates, the majority of the increase in the program's estimated costs over time has been associated with the east span of the Bay Bridge. However, the Richmond-San Rafael Bridge's costs have also significantly increased, growing by $249 millionor 37 percentsince the 2001 estimate in AB 1171. Bid for SAS Allowed to Expire. In August 2004, the administration proposed using additional and redirected toll revenues to fund the entire $3.2 billion cost increase for the program. The Legislature rejected the administration's proposal, but did not have sufficient time to resolve the funding issues before it adjourned at the end of August. In the absence of additional funding for the program, Caltrans allowed the bid for the SAS portion of the east span to expire at the end of September. At the same time, the administration began to re-assess its options for the bridge's design in the hope that another design would be less expensive. Caltrans has completed seismic retrofit work on five of the seven toll bridges in the seismic retrofit program. At this time, only the Bay Bridge and the Richmond-San Rafael Bridge remain to be completed. Caltrans' latest estimates are that the Richmond-San Rafael Bridge is 80 percent complete and will be finished in 2005. The west span of the Bay Bridge is complete except for the rebuilding of the San Francisco approach to the bridge, which will last through 2008. The Bay Bridge east span has the most work left before completion, and is not likely to be open to traffic before 2012. The viaduct portion of the east span is currently under construction and is projected to be complete in 2007. Not coincidentally, the bridges that are taking the longest to complete are also the cause of the program's most recent cost overruns. Figure 5 shows the administration`s August 2004 estimate of the additional funding required to complete these two bridges, broken down by bridge and, for the Bay Bridge east span, by the major bridge components. The figure shows that the Bay Bridge east span accounts for 77 percent of the additional program costs, with the SAS accounting for 41 percent of the total. Figure 5 also shows that 14 percent of the additional $3.2 billion in estimated costs is for added contingency funding, which cannot be attributed to any specific bridge. Not shown in the figure is the administration's estimate that costs on the other bridges in the program have actually decreased by $48 million from their 2001 estimates. After allowing the bid for the SAS contract to expire, the administration focused its review efforts on three main alternatives (with some variations) for the Bay Bridge east span. These included: rebidding the existing SAS design, redesigning the bridge as a cable-stayed span, and redesigning the bridge as an extended skyway with no tower. Independent Review Team (IRT). The IRT, consisting of nine construction industry professionals, examined the technical feasibility of the different design options, including cost and schedule impacts. Peer Review Team (PRT). The PRT was led by the Federal Highway Administration (FHWA) and included FHWA staff, representatives from other states with large transportation projects, academicians, and management consultants. The PRT's goal was to assess the risks associated with each of the alternatives based on input from the IRT, Caltrans, the bridge designer, and a previously-completed report by an outside consultant. Caltrans. Caltrans conducted its own review in addition to those performed by the IRT and PRT. As part of its review, Caltrans consulted with construction, insurance, and design firms, as well as state and federal regulatory agencies and public interest groups. No Consensus on Redesign Alternative; Administration Recommends Skyway Option. Based on its technical review, the IRT concluded that changing to a cable-stayed design was the most attractive alternative. This is because the IRT found that a cable-stayed bridge could require minimal changes to the already designed SAS foundation, and would require only minor modifications to existing permits. The IRT estimated that the cable-stayed bridge could save the state more than $600 million without delaying completion of the bridge. Caltrans, however, concluded that the state would not be able to achieve the cost savings identified by the IRT. This is mainly because both the cable-stayed and skyway options were only at the "conceptual" stage, meaning that very little design work had been performed. Because of the uncertainty associated with estimating costs for projects at this early stage of development, Caltrans concluded that it would be appropriate to add a significant amount of contingency funding to the respective cost estimates, thereby reducing the potential cost savings. Additionally, Caltrans noted that altering or canceling other ongoing east span contracts due to a redesign would further increase the cost of a redesign. As a result, Caltrans' first recommendation was to rebid the existing SAS design. However, Caltrans also noted that, while much uncertainty existed for any redesign of the bridge, the skyway design would be simpler to construct than the other options and provided the most potential to save money from the existing SAS design. Therefore, Caltrans also recommended that the state consider pursuing a skyway design. The PRT did not recommend any one option over the others, but rather estimated the relative risk of cost and schedule growth associated with each option. The PRT concluded that the existing SAS design had the lowest risk of all the options. This remained true even when risk due to lack of public acceptance was excluded from the redesign options, though under this second scenario the skyway design ranked a close second to the SAS. Based on the input received from these sources, the administration recommended in early December 2004 that the state redesign the Bay Bridge east span as a skyway. However, the administration indicated that it would also continue to prepare the existing SAS design for a rebid. This is a reasonable course of action, as it preserves the Legislature's option to choose to keep the existing bridge design. The administration indicated that it could rebid the SAS in early 2005 if funding were available. However, the administration did not revise its cost estimate for the toll bridge seismic retrofit program. For the toll bridge seismic retrofit program to move forward, the Legislature must address both the design of the Bay Bridge east span and the funding for the entire toll bridge seismic retrofit program. Since the current SAS design of the east span is specified in statute, the administration cannot pursue a redesign without legislative action. Furthermore, since statute also specifies a funding cap for the program that would not provide sufficient funds to award the contract for either a rebid of the SAS design or a redesigned bridge, additional funding must be identified for the program before bidding that contract. The Legislature's decision on the bridge design has a direct bearing on when additional funds are required. If the Legislature chooses to retain the SAS design for the east span, funding is needed more quickly than if it decides to redesign the bridge. This is because Caltrans could be ready to rebid the SAS contract in early 2005. The earlier funding is provided, the sooner the SAS contract could be rebid and awarded. If the Legislature chooses to redesign the bridge, that new design would take some time before it would be ready to go to bid. This would allow the Legislature more time to consider the program's funding. In either case, the Legislature must decide on the bridge design as soon as possible. The following sections detail the options before the Legislature in dealing with these two issues. We first discuss the issue of the design of the Bay Bridge east span. In particular, we note the tradeoffs that the Legislature faces in weighing the potential savings of a redesign against the risk of cost and schedule increases associated with a redesign. We recommend that the Legislature request additional information from Caltrans to assist it in making its design decision. We then discuss the funding options before the Legislature, noting that there is no analytical basis for determining the proportion of funding that should come from state sources versus local sources. We recommend that funding come from both state and local sources. We further recommend that the toll bridge seismic retrofit program be made more like the state's other transportation funding programs by removing the statutory funding cap and giving Caltrans an incentive to control any additional cost increases. Finally, we note the need for continued oversight of the toll bridge seismic retrofit program and recommend that the Legislature implement the State Auditor's program oversight recommendations and hold periodic hearings to oversee Caltrans' progress on the program. Should the Bay Bridge East Span Be Redesigned? Various engineers and designers have reviewed the design options for the Bay Bridge east span and estimated the costs and schedules for the different options. A comparison of the various studies and their conclusions highlights the risk-versus-reward tradeoff that the Legislature faces in choosing the bridge's design. Figure 6 shows the different construction cost estimates of the various teams that have reviewed the design options. The figure includes not only the IRT's and Caltrans' estimates, but also estimates from the bridge designer as well as the outside consultant originally hired to review Caltrans' August 2004 program cost estimates. As the figure shows, construction cost estimates vary widely for each bridge design, with about a $900 million difference between the high and low estimates for each design, including the SAS. Much of the difference in the cost estimates appears to be due to the different assumptions and methodologies of the different reviews. Nonetheless, the different reviews generally agreed on the relative cost of the different design options. 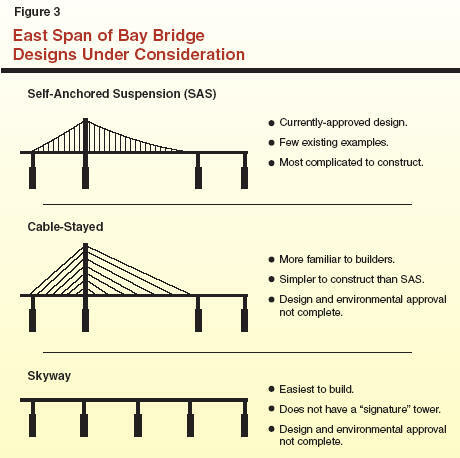 Specifically, Figure 6 shows that the construction cost estimates for the SAS are the highest of the design options, while the estimates for a cable-stayed or a skyway design are lower, with a skyway design having the lowest cost estimate. a All cost estimates include the cost of bridge foundations, but do not include Caltrans' support costs. b Cable-stayed estimates are for primary cable-stayed design, one of three such designs studied. c TY Lin/Moffatt & Nichol. While the estimates quoted in Figure 6 are informative, they are missing some key information. Most importantly, these estimates do not include the Caltrans support costs for each design, which primarily include Caltrans' costs to oversee bridge construction. These construction oversight costs would likely be different for each bridge design. Because the SAS is more complicated and would take more time to construct, it would require more construction oversight than the other options and would therefore likely have higher Caltrans support costs. To provide a true comparison of the costs of the different options, these costs would have to be included as well. While we do not expect the addition of the missing capital outlay support costs to change the relative order of the cost estimates for the different bridge designs, these potentially significant costs should be included to give the Legislature better information about the choice it faces. The cost estimates also do not factor in the potential cost and schedule risks that correspond to the results of the PRT's risk review, which we discuss in more detail in the following section. The review teams also estimated the completion dates when construction would be finished for the different east span designs, as shown in Figure 7. While the review teams differ in their estimated completion dates, the average of those estimates for each bridge design is the same2012. a Cable-stayed estimates are for primary cable-stayed design. b TY Lin/Moffatt & Nichol. Alternative Bridge Is Not Yet Designed. Both the cable-stayed and skyway designs that the review teams considered are at the conceptual level only, being no more than 5 percent designed. Much additional work would be required to fully design these bridges, which Caltrans estimates could take 18 months to 2 years. As design progressed, Caltrans would learn more about the seismic issues associated with the new bridge design. Addressing these issues would affect the ultimate cost and schedule of the bridge. By way of comparison, when the current plan for the east span was 30 percent designed, it was estimated to cost between $1.5 billion and $1.6 billion in total. The latest cost estimate of $5.1 billion for the current east span design is more than three times the cost estimate at the 30 percent design stage. Environmental Approval Has Not Yet Been Granted. There is significant risk of delay in environmental approval for a bridge redesign, with the most risk associated with a skyway design. Caltrans' report cited approval from several agencies as being high risk for a skyway design. For example, the United States Coast Guard has indicated that there is a risk that it may not approve any bridge design that significantly narrows the navigation channel east of Yerba Buena Island. Aesthetics of a Redesign Have Not Yet Been Agreed To. Bay Area representatives rejected a skyway design when Caltrans first proposed one, and it is not clear that there is agreement on the skyway design at the current time. Any lengthy debate on this topic could erode the possible cost and schedule benefits of a skyway redesign. In its review, the PRT evaluated the risk for each bridge design in four areas: (1) technical, cost, and schedule; (2) environmental; (3) management; and (4) acceptance and expectation. Figure 8 shows the relative risk levels for the three main bridge design options. Specifically, the PRT concluded that the SAS has the lowest environmental and acceptance risk because the design is already approved and the environmental process complete, but the highest management risk due to the complexity of the project and the possibility of again getting only one bid. The skyway, on the other hand, ranked lowest in technical and management risk due to the relative simplicity of the design, but it ranked among the highest in environmental and acceptance risk. As the figure indicates, the issue of design acceptance had a large effect on the PRT's final results. Recognizing this fact, the PRT recalculated the risks for each bridge excluding the acceptance issue area. These secondary results still rated the SAS as the lowest risk option, but with the skyway a close second. All of these considerations mean that the redesign options (cable-stayed and skyway) for the east span have a higher risk of cost and schedule growth than the existing SAS design. Thus, the Legislature faces a choice between an existing Bay Bridge design (SAS) that is known to be expensive and complicated to construct, but that has already completed the difficult design and environmental processes; and a redesign (skyway or cable-stayed) that initially has the potential to save money, but that could end up taking longer and costing more due to risks in the environmental and design phases. In choosing the design of the east span of the Bay Bridge, the Legislature must weigh its desire for lower costs against its tolerance of risk that could more than offset the potential savings. Because of the risk of cost and schedule growth for each of the east span design options, no amount of additional information would allow the Legislature to be certain that any one design is the "correct" choice. In our view, the design of the Bay Bridge east span is truly a judgment call for the Legislature. However, we believe some additional information is needed to ensure that policymakers are not misled by the seemingly precise cost estimates quoted previously. The amount of competition and thus the likely bid prices for rebidding the existing SAS design or for bidding a redesigned bridge. The amount of contingency funding that should be added to the cost estimate for bridges that are at a conceptual stage of design. The cost of canceling or changing the other Bay Bridge east span contracts to make them compatible with a different bridge design. The length and expense of the additional environmental review required for a redesign. We have also noted that the cost estimates of the various review teams do not include the capital outlay support costs that Caltrans would incur for each of the bridge designs. If all of the assumptions that fed into each cost estimate were made explicit, and capital outlay support cost estimates were added, the Legislature would be better able to compare the costs and benefits of the various bridge design options. This would facilitate the bridge design choice the Legislature must make. Accordingly, we recommend that the Legislature direct Caltrans to make explicit the assumptions that affect the projected cost and schedule estimates in its report and the IRT report, as well as for other estimates that may be available from the bridge designer or independent outside consultants. The specific cost and schedule implications of each of the assumptions should be made explicit to facilitate comparison among the various design reviews. We further recommend that Caltrans estimate the capital outlay support costs associated with each of the design options and include those estimates in the total projected cost for each of the design options. How Shall the Program Be Funded? The administration's cost estimate calling for an additional $3.2 billion in funding for the toll bridge seismic retrofit program was based in part on the assumption that the contract for the SAS span of the Bay Bridge would be awarded by September 2004. As this did not occur, neither rebidding the SAS nor opting for a bridge redesign will cost the same as the administration estimated in August 2004. Nonetheless, because the program will ultimately require multiple billions of additional dollars and there is no better estimate of the program's cost, we think that the Legislature should work from the assumption that it will need to provide at least $3.2 billion in additional funding. Previous Funding Has Come From Local and Statewide Sources. To date, the Legislature has twice increased funding for the toll bridge seismic retrofit program. In each instance, the Legislature decided to fund part of the increase with tolls collected from drivers on the Bay Area bridges and part with state and/or federal funds derived primarily from the excise taxes on gasoline and diesel fuel. As shown in Figure 9, total funding for the program was divided approximately in thirds with the enactment of SB 60 in 1997one-third from tolls, one-third from state transportation sources, and one-third from Proposition 192 bonds. In 2001, AB 1171 added over $600 million in federal funds that would have otherwise funded bridge rehabilitation projects around the state, as well as about $450 million in overrun authority that could be funded by state or federal sources. However, the largest source of additional funding in AB 1171 was an additional $1.4 billion that was to be generated from Bay Area tolls. This increase brought tolls' share to about 50 percent of the program's funding. New Funding Should Also Be Shared. 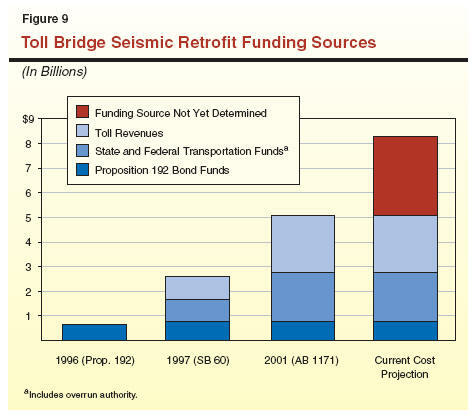 Who should fund the additional costs of the toll bridge seismic retrofit program? One could argue that improving the bridges' seismic safety benefits primarily users of the bridges and, therefore, charging those drivers (in the form of a toll) is an appropriate means to pay for the retrofit work. On the other hand, the toll bridges are part of the state highway system, owned by the State of California. Therefore, it could be argued that the state should pay for them from statewide transportation funding sources. We believe that both the arguments for Bay Area funding and state funding have merit. Therefore, we believe that the additional funding provided by the Legislature should include both Bay Area and statewide sources. There is, however, no analytical basis to determine exactly what percent of the program should be funded by tolls and what percent from statewide transportation sources. Ultimately, the exact funding split for the program is a policy decision for the Legislature. Depending on the funding split between state and local sources the Legislature chooses, the Legislature has a number of options to generate the funding the toll bridge seismic retrofit program requires. These options, listed in Figure 10, range from a large transportation revenue increase to a drastic cut in funding for other transportation programs, along with several borrowing options. In the following section, we discuss some of the pros and cons of using funding from each of these sources. Bond Against Increased Toll Revenue. Puts burden on users of Bay Area bridges, does not impact other transportation projects. Bond Against Future Federal Revenue. Reduces funding for transportation projects statewide. Issue General Obligation Bond. Increases General Fund debt service costs, putting additional cost pressure on non-transportation programs. Need for voter approval would delay funding availability. Use Near-Term State Transportation Funding. Severely reduces funding for transportation projects statewide. Increase Gas Tax Revenue. One state funding possibility would be to raise the excise tax on gasoline and diesel fuel. A 6-cent increase in this tax, for example, would raise more than $3 billion over three years. If the funding is not needed that quickly, smaller tax increases could be considered. Once the necessary amount of bridge funding was provided, the tax increase could be discontinued or used for other transportation needs. This option would spread payment for the retrofit program among all the state's drivers, while not reducing funding for other transportation projects. Bond Against Increased Toll Revenue. The largest funding source currently being used for the toll bridge seismic retrofit program is a $1 seismic surcharge on Bay Area bridge tolls. In effect until January 1, 2038, this surcharge will be used to pay the debt service on bonds issued in 2003 and to be issued in 2005 for toll bridge seismic retrofit, as well as to fund several other Bay Area transportation projects. Increasing the bridge tolls statutorily by another dollar (to an effective $4 per passenger vehicle) for 30 years would generate enough revenue to pay the debt service on an additional $1.9 billion in bonds. Relying exclusively on tolls for the additional $3.2 billion (for example, by increasing tolls to $5 per passenger vehicle) would put the entire funding burden for the bridges on Bay Area drivers, while not reducing funding for other transportation projects. Bond Against Existing Gas Tax Revenue. The State Constitution authorizes bonding against future gasoline and diesel excise tax revenues, subject to voter approval. The annual debt service on these bonds, however, must be less than 25 percent of the state's annual excise tax revenue that is used for street and highway purposes. Given that these revenues total over $3 billion annually, the state would certainly have the capacity to issue a bond to cover the entire amount of additional seismic retrofit funding needed. However, this would reduce gas tax funding for transportation projects statewide for the duration of the debt-service payments (typically 30 years). Another important consideration with this option is that, since it must be approved by voters, this funding source would not be available until after the next statewide election in June 2006 unless a special election is called before then. A June 2006 timeframe would be less of an issue if the Bay Bridge east span is to be redesigned, as that construction contract would not be awarded for at least two years. Caltrans has sufficient funding to cover its other seismic retrofit costs through the end of 2005, and the amount of additional funding needed to pay for ongoing contracts through June 2006 would be a small fraction of the total additional funding the program needs. However, if the Legislature decides to keep the SAS design, that contract could be ready to go to bid in early 2005. The earlier funding is provided, the earlier the SAS contract could be awarded. Bond Against Future Federal Revenue. Federal law allows states to bond against future federal transportation revenues. This debt instrument is known as a Grant Anticipation Revenue Vehicle (GARVEE) bond. Current state law limits the amount of GARVEE bonding. Specifically, debt service on the bonds cannot exceed 15 percent of the state's annual federal transportation funding. To date, the California Transportation Commission (CTC) has issued $658 million in GARVEE bonds to allow transportation projects to continue through the current funding downturn. In addition, the CTC's current policy is to issue GARVEE bonds with terms no longer than 12 years. However, even within these restrictions, the State Treasurer estimated in May 2004 that the state had the capacity to issue about $5 billion-worth of GARVEE bonds. Issuing these bonds would reduce funding for transportation projects statewide for the duration of the bonds by the amount of the annual debt service. Issue General Obligation Bond. Finally, the state's other major borrowing option is to issue general obligation bonds. Pledging the state's full faith and credit could provide all the funding needed by the toll bridge seismic retrofit program. However, because the General Fund already faces a sizeable budget shortfall, any additional borrowing would put additional pressure on non-transportation programs for the duration of the debt-service payments. Also, issuance of general obligation bonds requires voter approval. As with the bonds backed by excise taxes described above, if the SAS design is chosen, funding would not be available until the next statewide election in June 2006 unless a special election is called before then. Use Near-Term State Transportation Funding. The only major option that does not require borrowing or revenue increases would be to use state funding that is dedicated to other transportation projects in the near term. Cutting the state's expected allocations for new transportation projects in half over the next three years could provide over $3 billion for toll bridge seismic retrofit in the near term. However, this would have a severely detrimental effect on the rest of the state's transportation program. In addition to the options listed above, there are other funding options that could provide smaller amounts of money. These secondary options are listed in Figure 11. Even if all of the actions in this list were taken, they could not provide the amount of additional funding the toll bridge seismic retrofit program needs for project completion. However, they could be used to supplement one or more of the options in the previous list if the Legislature chose not to utilize those options to their fullest extent. Refinance Existing Toll Bonds. Consolidates all toll bridge financing under Bay Area Toll Authority. May free up $400 million to $500 million with little downside effect. Redirect Toll Money Used for Other Purposes. Reduces funding for specific Bay Area transportation projects to generate $550 million. ten years to generate $150 million bonding capacity. demolition not needed for more than five years, delaying about $300 million in future costs. Refinance Existing Toll Bonds. Currently, the seismic surcharge dollar in the Bay Area tolls is administered by Caltrans, while the other two dollars of toll are administered by the Bay Area Toll Authority (BATA). One option originally proposed by the Governor in August 2004 was to consolidate the administration of all tolls under BATA. This would allow BATA to combine the toll bridge seismic bonds with its own outstanding debt and refinance them as a single package. The BATA estimates that this could reduce debt-service costs and free up $400 million to $500 million for use on the seismic retrofit program. This money would come at no expense to other projects and would not require a revenue increase. Redirect Toll Money Used for Other Purposes. A portion of the revenue from the current seismic surcharge is to be used for certain specified Bay Area transportation projects unrelated to toll bridge seismic retrofit. The administration has proposed redirecting this money to the seismic retrofit program. This action could generate an additional $550 million, though this would be at the expense of those Bay Area transportation projects. Extend Existing Seismic Surcharge. The current seismic surcharge is set to expire on January 1, 2038. Extending this surcharge for ten years and bonding against that revenue stream would allow the state to generate approximately $150 million. This would be paid primarily by Bay Area drivers. Delay Funding for Old East Span Demolition. While it is not technically a source of funding, the state does have the option of delaying the provision of funding for the demolition of the existing east span of the Bay Bridge. This would reduce the amount of funding the state must raise in the near term by approximately $300 million. The existing span cannot be demolished until after the new span is complete, so funding will not be needed for this contract for more than five years. Additional Cost Overruns Should Be Anticipated. 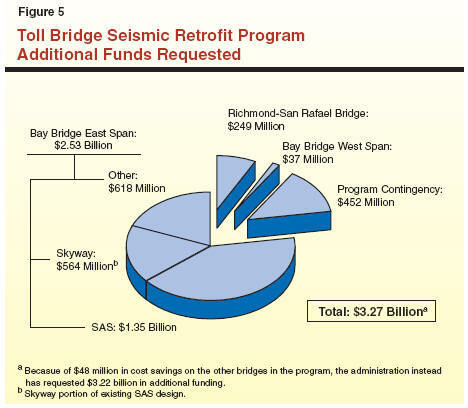 As noted earlier, the administration's estimate of a $3.2 billion shortfall in the toll bridge seismic retrofit program was based on an assumption that the contract for the SAS design of the Bay Bridge east span would be awarded in September 2004. This did not happen, so the ultimate cost of the bridge will likely be different. Further, no matter which bridge design is ultimately chosen, there is potential for cost overruns and schedule delays on all of the ongoing and future contracts. Because of these factors, the amount of additional funding that the toll bridge seismic retrofit program will ultimately need is unknown. As work continues and the amount of work left to complete is reduced, the risk of further cost increases will begin to decline. However, risk remains that Caltrans' current cost estimates are still too low. Most Transportation Projects Do Not Have Statutory Funding Caps. Most transportation projects funded by the state do not need statutory overrun authority because they do not have specific funding caps set by the Legislature. Instead, the CTC allocates to each project the amount of funding the project sponsor expects to need. When Caltrans or a local transportation agency needs to expend more money on a project than was originally allocated, the CTC then generally provides a supplementary allocation. However, Caltrans and each regional transportation agency only get a fixed share of the available transportation project funding over a four-year period. If one of a project sponsor's projects requires a supplemental allocation, the amount of that allocation is deducted from the sponsor's share of the funding, so that it has less money available for other projects. In this way, project sponsors have an incentive to keep their projects within budget. Legislature Could Remove Funding Cap While Providing Incentive to Reduce Costs. Similarly, the Legislature could allow Caltrans unlimited expenditure authority for the toll bridge seismic retrofit program, but specify that any funding required beyond that currently estimated be counted against Caltrans' share of transportation funding. In this way, any further cost overruns on the toll bridges would impact Caltrans' other programs. The Legislature could structure this funding to ensure that individual counties' projects are not affected, by specifying that the additional funding is to come from Caltrans' interregional highway expansion program or Caltrans' support budget. Similar action was taken with the provision of state funds for the toll bridge program in SB 60 and AB 1171. Of the $875 million in state funds provided by SB 60, $300 million was to be achieved through "better efficiency and lower costs" at Caltrans. Also, to the extent the overrun authority provided by AB 1171 was to come from state funds, it was to affect only Caltrans' highway rehabilitation and interregional expansion. Providing additional funding in this way would reduce the likelihood that the Legislature will again have to adjust funding for the program in the future, while providing an incentive for Caltrans to try to control any further cost increases. Even after the Legislature makes design and funding decisions, it must continue to oversee the toll bridge seismic retrofit program. As noted earlier, the program still faces substantial risk of cost and schedule increases over the remaining years of the program. The Legislature should hold the executive branch accountable for delivering the program and exercise its oversight to reduce the likelihood that it will again be surprised by a large budget overrun. At the Legislature's request, the Bureau of State Audits (BSA) conducted an audit of the toll bridge seismic retrofit program to determine the causes of the most recent cost increases in the program and to examine Caltrans' project management practices. In its report released in December 2004, BSA found among other things that Caltrans has failed to report on the program to the Legislature to the extent required by statute. Caltrans did not submit a required annual report to the Legislature in 2003, nor did it submit the first required quarterly report in 2004. The BSA recommended that the Legislature change statute to require that Caltrans submit each report by a certain datefor example, within 45 days of the end of each quarter. The BSA also recommended several improvements to the reports that Caltrans submits. These recommended improvements include reporting additional information, such as a comparison of the program's budget with actual and projected expenditures, as well as more review of the information submitted, including certification of the reports by the Department of Finance and/or an independent engineering consultant. We think that adopting BSA's recommendations, and holding periodic hearings on the program's status, would improve the Legislature's future oversight of the toll bridge seismic retrofit program. The Legislature faces two major decisions for the toll bridge seismic retrofit program: (1) which design to use for the Bay Bridge east span and (2) how to fund the program's completion. There are a number of options for each major decision. Ultimately the design choice is a judgment call requiring the Legislature to weigh its desire for lower costs against its tolerance of risk that could more than offset the potential savings. Regarding funding for the program, we think it should include both state and local sources. The Legislature has several options regarding the specific sources used and the amount of funding provided from each.